Fort Smith Stylista: Jan Goes Shopping. Shop, Jan. Shop! Okay, it's not like I never get any retail therapy. Clearly, I get my share. But I don't often get to go to a much bigger area with a lot more stores. Last month, I wrote about meeting the lovely Trina of Tea Time with Trina up in Rogers and a pre-meet-up shopping trip that made me disgracefully late. (See what I did there? I blamed an innocent mall for my tardiness. Sad.) But instead of the pitiful Karma I deserve, Dan kindly took me back up for a belated 20th anniversary dinner/ Mother's Day treat that included more time to shop at the Northwest Arkansas Mall. Yeaaaay. Since it was hot and humid again, I wore some carefully calculated shopping togs. A favorite linen top with sheer paneled yoke, easy skinnies and comfortable heels that are cute enough to wear to dinner. Yes, the top wrinkles like mad in the car but it's wonderful to wear; cool, un-soggy and flattering. I just carry on and carry my clutch so it covers the wrinkles. I know you've all seen this mall ... it's just like yours where you live. But this is one of the best in our little state, and I was happy just to be an elderly mall rat for the afternoon. 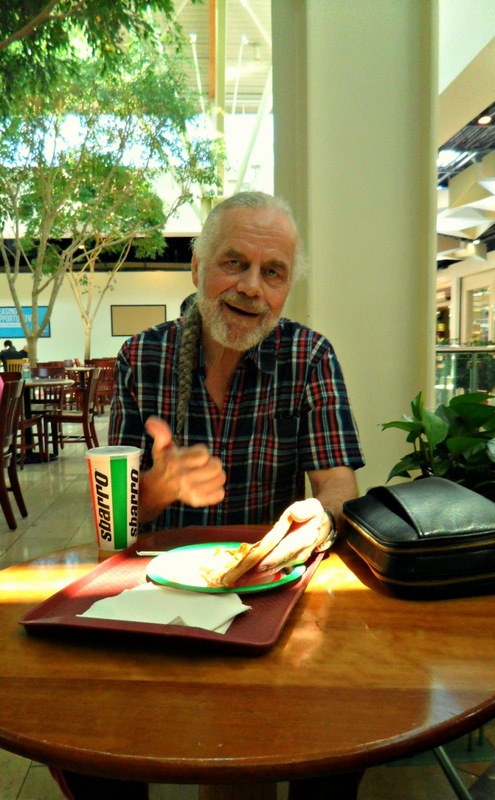 While I was checking out the first shops, Dan settled in the food court to read and have a cup of coffee. This court just like the one in your local mall, except that not one of the little specialty vendors offered the cup of coffee that Dan had wanted. So he had to get a coke. And then he had to have a slice of pizza so he'd have something to wash down with the coke. I got a bite, then left him to it while I went for more shoppy-shoppy. 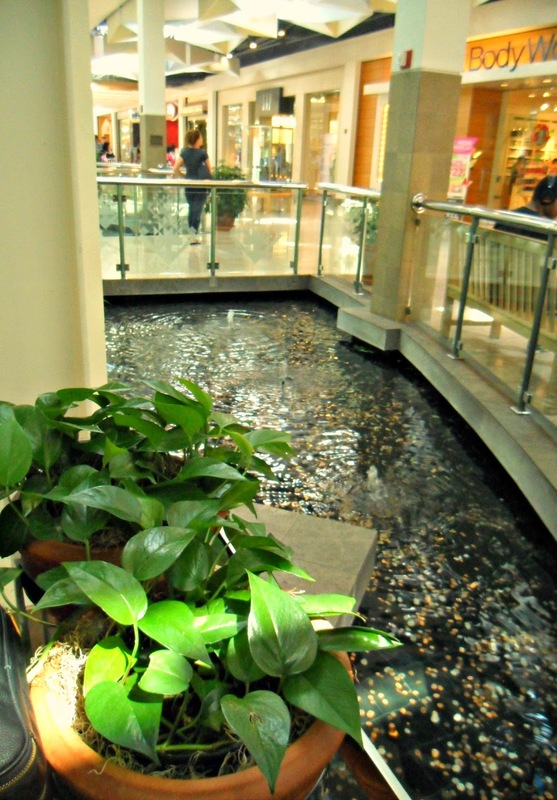 Unlike our more local mall, The North West Arkansas Mall boasts a set of water features/wishing fountains. Burbly and peaceful and a lovely damper for the hum of ever-present mall noise that Dan dislikes a lot. He was happier and more comfortable than usual, and accordingly, so was I. The mid-afternoon lunch didn't hurt his mood either. ... and what I imagine to be an average size Forever 21. I'd never been in one before! No one asked me to leave, so I guess it was okay. I saw some things that wouldn't look awful. Who'd a thunk it? 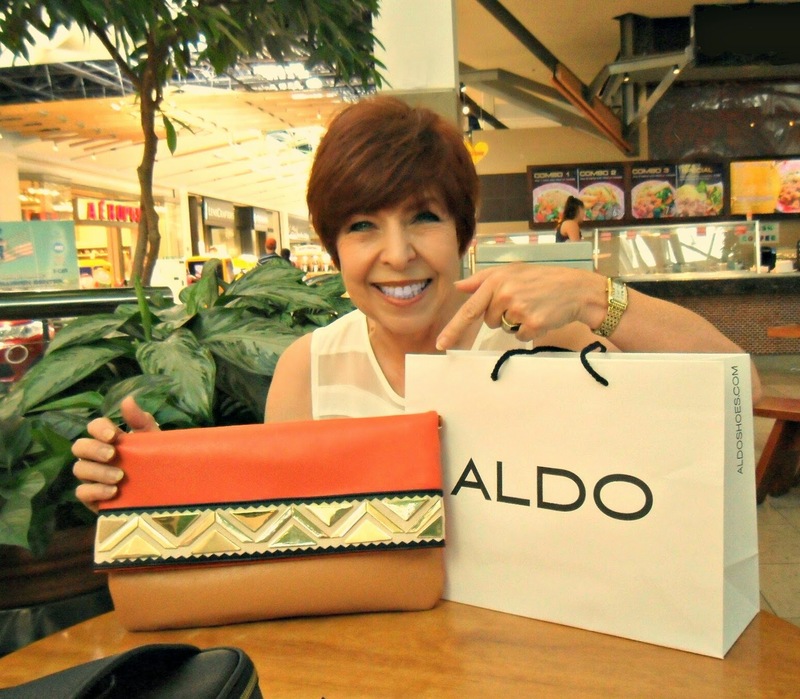 But for me, all roads lead to Aldo, and sure enough, they did not disappoint. I found the rarest of all items, a clutch that will hold my Kindle Fire and a wallet and a phone! I really wanted one that wasn't cream or black. And it came with a Mother's Day discount for all moms, or might-be moms, future moms, or even women with no desire to be a mom, ever. I showed Dan my beautiful gold metal and tan and coral clutch, prattling happily on about how I had a black one with metal studs, and a black and cream one, and a black one with pink-gold trim. And how thrilled I was with my new, bright coral favorite. "Is that a true coral, or just orange?" he asks. "Oh, well... maybe it's just orange ..." I concede, stupidly.
" Then is Orange really the New Black?" he asks, grinning like a very smug, graying, pizza-stuffed monkey. It was. I was finished shopping, and I didn't come home with bags of stuff. I get a little overwhelmed by so much to choose from. So many new stores, and so much wider selections in the larger versions of the familiar ones that we have closer to home. I'll do more damage next time, perhaps, but it felt just fine to go home with just my Aldo shopping bag and one perfect item in it. We had to go back to our favorite PF Chang's. When we were there with Trina, it was dark and rainy and late. Our camera was uncooperative then, but it was sunnier and earlier this time,so I thought you should see how pretty the dining room is for a chain restaurant. We got to sit in my favorite section (again!) and opposite is a specially commissioned painting on paper that was made for this particular location. The setting is 12th century China, but the narrative alludes to events from the history of this part of Arkansas. It's a beauty, with hidden elements that guests are invited to try to find ... sort of an elegant and historically inspired Where's Waldo. I collect chopsticks and chose these to bring with us. They are a Japanese style "hashi" but I won't tell if you don't. 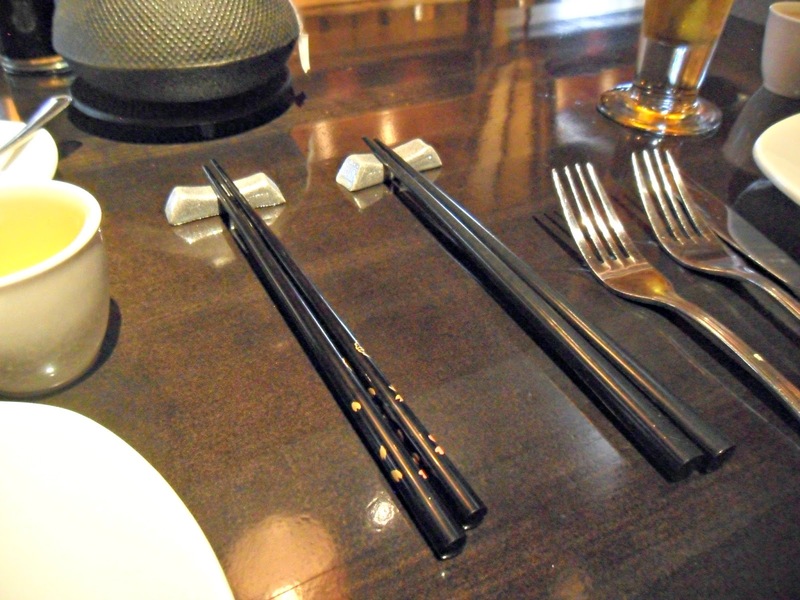 I like the little nicety of these tiny pieces of sculpture or porcelain figures used as a rest for the chopsticks so the tips don't touch the table. They're called "hashi-oki" and I collect them too. I've made some, as I did this pair. They're made of a silvery coated clay in a bridge shape. As one does. We used our chopsticks to eat way too much completely delicious Chinese food, and we'er both pretty handy with them, if I do say so myself. The perfect end to a special trip out of our usual stomping grounds. Don't worry ... Dan had plenty of room left after his pizza snack. He did just fine. Beautifully narrated and photo-curated, Jan! I felt like I was right there with you. I'm glad you finally got into an F21 and I'm also glad you didn't run away screaming. I'm not a purse person and ALDO shoes are always too small for my wide feet but I'm glad you found a choice piece on your shopping expedition. What fun! 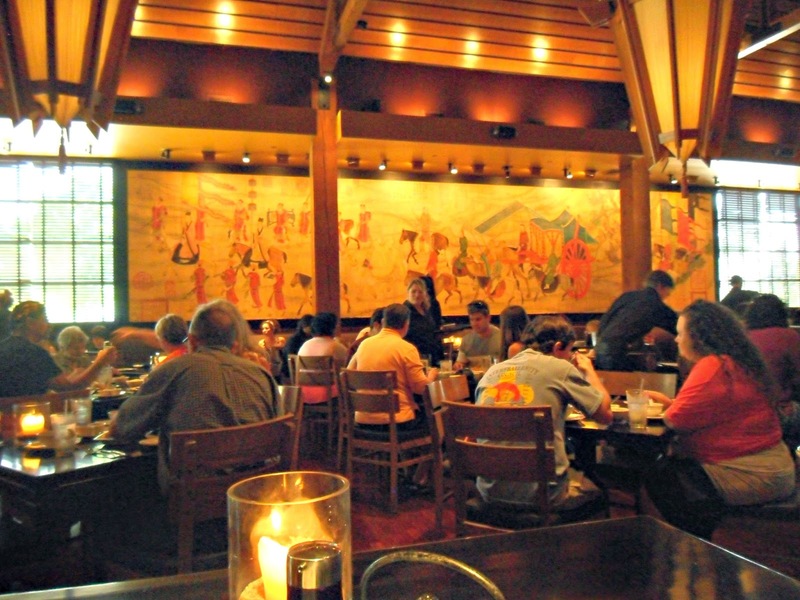 PF Changs, is one of the trendy eateries here as well. I often wonder how men really feel about our need to shop. Your husband, like mine, is patient and a trooper. Sometimes I watch him struggle to make conversation with me about style. Poor guy. I like your easy, simple and albeit chic outfit. Did you find any off the shoulders? I think I take my local shopping malls for granted. I live close too several famous malls in Southern CA and I am always there during my lunch hour making returns. There's always tour buses full of tourist just there for shopping which I guess is a good thing to help the economy. Love your new find! Such a great color. And your top is so pretty - I love the sheer panel details on it. Sounds like one great shopping trip, love the clutch, to me I'd say coral. Husbands are the same the world over when it comes to shopping I,m sure. They don't do browsing, they find what they want and then they are done. I like wearing linen in summer too, so cool and comfortable., yours is simply lovely.I was told by a snooty shop lady years ago that you know it is real linen when it creases, so I haven't worried since. You go girl!!! Like the length of your pants drawing the eye to your beautiful ankle strap shoes! They say shopping is cheaper than a therapist, now there is a tactic to go by! The clutch is on my "to do list"-gorgeous!! you look great. And this is a real big mall. Your top is so stylish, with the sheer details that make the difference. You look very elegant. What a beautiful clush, I love Aldo's. Pitty it's too expensive in my country. Howww, eating with chopsticks.... I'm terrible with them (lol). Normally I avoid shopping malls (or centres, as we Brits call them) like the plague but I loved accompanying you and Dan from a discrete distance. Your outfit is fab and I love the bag you bought. I'm going with the orange, too. Ah...a man after my heart...he's like Mrs. Blandings, but handsome and with an AWESOME pony tail! And how cool that you have a chopsticks collection! And! I did not know that hashi is the Japanese word for the eating utensils. I am definitely going to show off my new word the next time I'm out for Japanese food! I love your hashi-oki too! I always fold my paper hashi wrapping into a triangular shape for keeping my sticks off the table...how lame in comparison! Jan! You are great, and I always love visiting! Oh...American malls, I do so miss them. My favorite is Penn Square mall in Oklahoma City when I visit my family. In Little Rock, I always liked Park Plaza mall. But, having said that, I enjoy looking in malls more than buying in them. I prefer the little off beat shops. I sure like that clutch! And your traveling outfit is great. And I envy your heat. Here we are almost mid-May and it's about 55 degrees here today and gray. I miss me some SUN and HEAT! I never had a problem with Arkansas's heat. This is a great post!! So funny too. I loved your sentence: "And it came with a Mother's Day discount for all moms, or might-be moms, future moms, or even women with no desire to be a mom, ever." hahaha. Funny. And ..."sort of an elegant and historically inspired Where's Waldo." I was thinking the same thing and I hardly know (of) Waldo, being Dutch. So you made me laugh there. And the hashi-okis... home-made ... as one does hahaha. This is what Ron and I agreed upon too. When we go shopping together (not like it used to be: 4 hours on a stretch), he will sit with a book or a paper and I will shop. Love the clutch; beautiful colors. And what a witty husband; you must really want to clonk him sometimes (in the most loving way, of course). Let's see if I can keep up better this week! Thank you for reading ... always fun when you tell me I've done well. On reading replies here today, I'm reminded how uncool shopping centers are, and I'm a little chagrined that I made a big deal about my little trip. It is a constant frustration to live in such a tiny piece of the world. If I had to name a personal style issue it would be that I'm a city girl cooling her heels in the country. Thanks for taking it as it was meant, and not as a paean to mall crawling. Just my joy at getting out of Dodge for a day. PF Chang's Bistro here is a great pleasure ... it's so hard to find anything out of the ordinary, and Dan and I run toward anything that is so different from what we do at our restaurant. Clearly, what's trendy on the coasts is a huge treat for us. It's only been a couple of decades since we couldn't find a decent restaurant with a decent glass of wine. Chang's has a pretty nifty wine list, for any place at this price point. Always a plus for me. And the food is very well prepared. Asian cuisine for Americans is always it's own thing, and not always (or even often) traditional. Even then, it's a pleasure when done well. Dan's a bit of a fashion plate if you scratch his surface, and will pretty effectively think about what he likes to wear. But he's so many hours on his feet that food courts mean some undisturbed reading time ... makes it easy for me to move fast and low through the stores. Thank you ... glad you like my outfit. Thanks, Alice! The color (and it is a soft coral and tan) is much prettier than in the picture. Happy too, that you like my top. It's also much better IRL! I used to avoid the malls when I lived on the west coast as well ... I'm old enough to remember when they were a big deal in decades past, but can be exhausting and so much the same stores, often repeated. Especially in heavily populated areas. The shopping is clearly less than ideal, but it's a treat for me, nowadays! Yup ... really, coral it is. Thank you! Glad you liked it! Yes, you have it right about how men shop. Actually, it's closer to the way I usually shop as well. I'm not so much of a browser as a scanner. I make a broad visual sweep to get the feel of the place and am sometimes out the door after just that. I don't ever just window-shop ... I don't go at all unless I'm looking for a purchase. I didn't go into any of the familiar stores ( except JC Penny ... the store there carries much better merchandise than the one closer to us.) Just shopped the new-to-me ones. Looking back, we were there less than an hour and a half. So he wasn't inconvenienced too long! I worry sometimes that I'll find him asleep and snoring in the chair! I don't have much linen, but what I do, I love! It isn't common here at all. You're a great story teller Jan. Loved reading about your special day, dressed perfectly for the event. I'm impressed with your chopstick making talents. I love them too, as pieces of art! Shopping and going out to eat...my two favorite things to do! Love your new clutch! Cute outfit too! Glad you like my black and white shopping uniform. Those are my favorite shoes ... very comfy, buttery leather. I'll be taking my new baby out and about ASAP. Thank you, Nicolene! Thank you, Jennifer ... glad you like the look. Yes, the NW Arkansas mall is pretty good sized, but there are lots larger. It's what we have to work with! Having trouble finding you website ... send a link, please? I think of all my friends, you understand what it's like to be removed from shopping! Going north to the larger metropolitan area is like going to the mainland. I get it, Seeker. Thank you so much for your sweet remarks ... they always improve my day. I knew Aldo had a lot of stores but had no idea how many. The company has a pretty good ethic about their employees and community, so I feel better about buying there. Our little Aldo shops are tiny here, but with enough styles to make me stop there first when I'm looking for a particular thing. Here, they're sort of a lower mid-range. Yes, for us anything about food is a hobby, and we use our chopsticks even at home, sometimes! Hope you're feeling better today, and that this is the start of a good week! Hello, Sabina. No, we made photos on our way out the door, before the shirt got wrinkled. It sure was wrinkled later! That's just linen. So happy you dropped by! Thank you for your kind comments. Thanks for reading, Vix! I'm pleased you liked my bag ... it looks orange in the photo, but it's really a creamy coral. I am looking for a few specific items this time of the year, and haven't had much luck, but I had a bit of fun trying. Shopping centers are not ideal, of course, but they're what we have here. We'd have made sure you had fun had you been with us! Thanks for getting that the post was not so much about the joys of mall shopping as it was about my getting to get out and about, away from the same-old-same-old. Nah. You wouldn't starve, darling Vix. For a while here, there was a big diet fad based on the fact that we'd all eat less if we used chopsticks. The authors failed to factor in the very human ability to get really good very fast at any way we have to get food from the plate to the mouth! Bazillions of people do it every day, not one of them any more dexterous than you! Bet you'd be an ace in five minutes. I voted for you today! Didn't know you were running, but so glad to put my ballot in the box! Sorry, Sue ... Who's Mrs. Blandings? I don't catch the reference. Inquiring minds want to know! Actually, the kind of chopsticks you're talking about (the disposable ones at Asian restaurants) are called waribashi. There's a link below you might find interesting. The author says that in Japan alone, some 25 BILLION pairs per year are used and then tossed! I've seen photos of garbage trucks in Tokyo, overflowing with the sticks. Add users in China and lots of other places in the world over and that's a big impact on the environment. Trees, bamboo gone, not to mention the manufacture and packaging waste and energy and polution. There's an actual conservation effort called the "My Hashi" movement. The idea is simply to carry and use your own. There are no end of clever styles to carry. I have them in wood, bamboo, metal, even metal. We even have a pair each of sterling silver ones, Chinese ... last century. I've learned to make origami style rests from waribashi papers, too! It's a fun thing to do for kids at a group table at a teppanyaki style, Benihana-like restaurant. It's a great thing for kids to understand the much of the world with older cultures than ours use very different implements to dine. Thanks, Sue for listening to me rattle on. Another hobby of mine! So typically for this time of year ... yesterday it was almost 90, and tomorrow it will be in the high 50s. I hate the humidity. I'll never get used to it. If I could, I'd send you some. 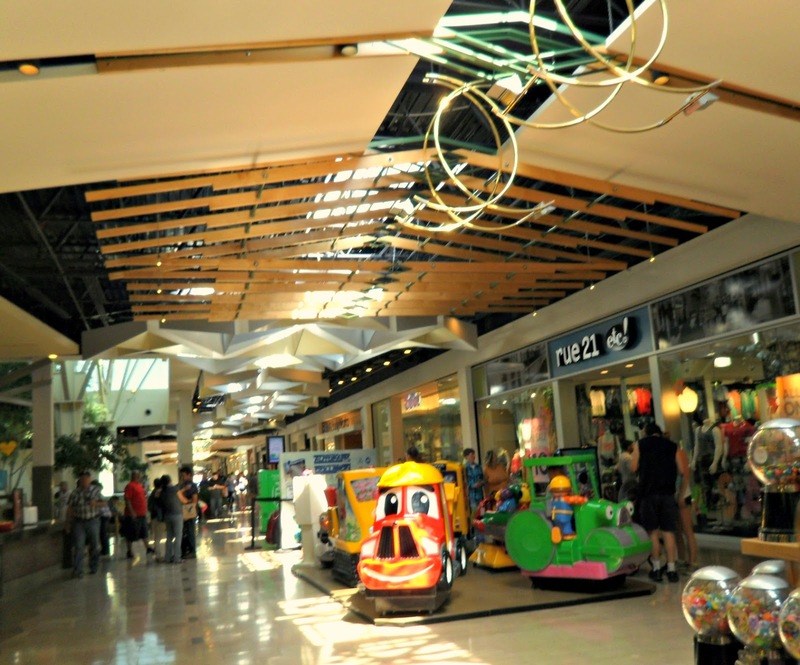 Have you been to NW Arkansas, around Rogers, since the Promenade Mall was built? It's a real "mall" in the tradtiional sense, with streets and open air. When it opened a few years ago, the shopping was excellent and interesting, but recently they've gone all Payless Shoes and Forever 21. I'd love to live where there were sweet little shops again, but looks like that isn't to be. It seems my lot to make do with big box stores and malls. Dan's stopping on the way home tonight for a Lotto ticket ... fingers crossed! I'm pleased with my clutch as well. Thank you ... it's prettier than in the photo. So happy you dropped by. Hope your weather warms soon! Thank you, Curtise, for getting my dumb jokes! Only Dan's are worse than mine. He works so hard for the laugh sometime. Yes, malls are prosaic and low-brow and lots of bad things, but I'm glad you got it that my story was about getting away from our so-limited little environment for a while. Even if it was only to a little larger, blingier mall atmosphere. Dan would always rather go with me than stay home ... even if he'd rather be napping on the couch. Good sport, and we are lucky that we value each other's company. I never stay that long ... an hour and a half at a time is about all I can take! However, I could sit all day and watch you wander around your shopping venue! Someday, Greetje! Ha! Long ago, I learned to be his straight man ... he loves it that I get even his most obscure jokes. He works so hard for them. He's been punched in the shoulder a few times for his best efforts, though. Lovingly, of course. Thank you, Sandy. Glad you like my clutch ... it really is a soft coral! You're so adorable, Jan! I bet we would have fun at the mall together! I'm always surprised when they don't chase me out of Forever 21 too! My hubby hates to shop, so placating him with food is always the way to go! "I want it to be a soft green, not as blue-green as a robin's egg, but not as yellow-green as daffodil buds. Now, the only sample I could get is a little too yellow, but don't let whoever does it go to the other extreme and get it too blue. It should just be a sort of grayish-yellow-green. Now, the dining room. I'd like yellow. Not just yellow; a very gay yellow. Something bright and sunshine-y. I tell you, Mr. PeDelford, if you'll send one of your men to the grocer for a pound of their best butter, and match that exactly, you can't go wrong! Now, this is the paper we're going to use in the hall. It's flowered, but I don't want the ceiling to match any of the colors of the flowers. There's some little dots in the background, and it's these dots I want you to match. Not the little greenish dot near the hollyhock leaf, but the little bluish dot between the rosebud and the delphinium blossom. Is that clear? Now the kitchen is to be white. Not a cold, antiseptic hospital white. A little warmer, but still, not to suggest any other color but white. Now for the powder room - in here - I want you to match this thread, and don't lose it. It's the only spool I have and I had an awful time finding it! As you can see, it's practically an apple red. Somewhere between a healthy winesap and an unripened Jonathan. Oh, excuse me..."
Mr. PeDelford: You got that Charlie? Charlie, Painter: Red, green, blue, yellow, white. Rattle away on any and all subjects Jan! I'm always all ears. I do think about the waste, and it is such a very good idea to bring one's own sticks! Dan is rather adorable though not quite as adorable as you are! I hate malls but sometimes they make for some efficient shopping. We don't have any decent malls where I live, just the icky kind with a grocery store, a drugstore, a real estate office and a few random independent businesses. 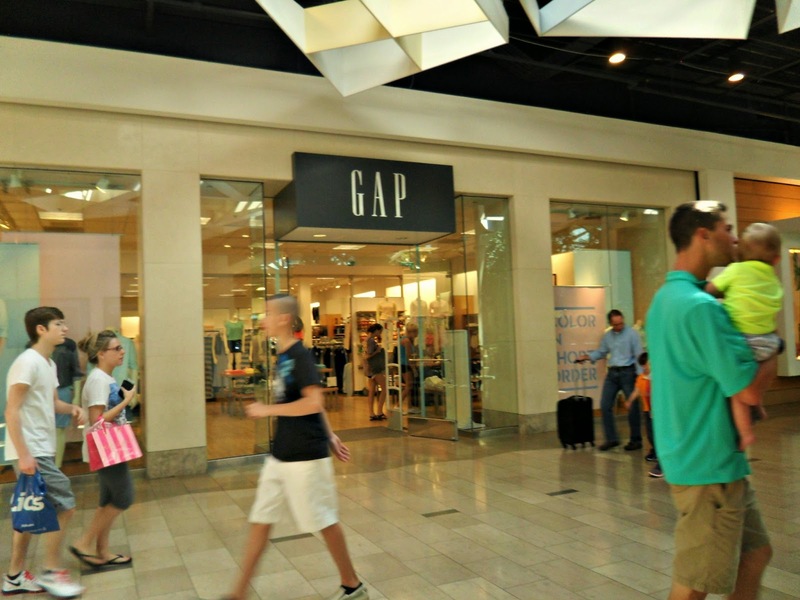 We have to go to Nanaimo to get to a mall with clothing and shoe stores like Gap or Aldo. I am quite hungry now after this! Thank you Natalie. Glad you enjoyed it. I have mixed feelings about posting it, now, but they can't all be winners, our posts. I'm pleased with my clutch, though, and carried it happily yesterday. It has a thin leather strap that I will actually use. I don't like chains for a cross-body or shoulder bag. That's Dan ... he's always ready to eat! I'm guessing you are probably fun to be with just about any place you go, Dawn Lucy! I bet you're right. It isn't that Dan hates shopping so much as he likes a place to read where he can get all the junk food and beverage he wants. Sort of like standing in front of a really big and amazingly well stocked fridge, all picking and choosing. Fabulous idea ... recliners, couches, big-screen televisions, pool tables and maybe even nap pods. Food. Beer ... we should do a franchise! "ManCaves R' Us." Awwwh. Thank you, Shawna. He is pretty adorable, for the most part! It's the only way I can manage specific items if I want to touch and try-on. Like you, it's always a journey. Puts them into a little different perspective when they are not ubiquitous. No, you can use the singular in this case. You got it right. Using either "a man" or "men" would be instantly understood in very similar ways. I'm so admiring that you speak more than one language ... most of us in the US do not, but should! Dan swears he isn't colorblind ... but we often perceive color in very different ways. I say turquoise, he says green or blue depending on how he sees the color temperature! Thank you, Catherine ... so happy you think it's pretty. And it really is coral. Ah. I saw this years ago, I know. On an afternoon with my grandmother, with tea. And sometimes eclairs. Thank you. I get it now. Yup. I did screw that up. I was thinking about the few women who really seem to get my puns ... Curtise is one of them. I'm sorry. Just stupid and a little tired. I'm weird like that. I sort of blast through my shopping. I'm even that way in a museum. I've found that after years looking at art, my limited time is best spent looking at the pieces I like or am quickly drawn to. Seven hours is a long time to do anything! Perhaps in some top notch shopping areas, with wine and dine breaks ... that would work. It's very strange to have no coffee at all in any of these places! Jan, the top looks gorgeous on you! Your new clutch is terrific! I'm glad you had a wonderful time while shopping and dining with your husband. Actually your shopping mall looks like ours. The same light, nearly the same fountains. But different shops. We don't have a forever21 shop here. Your new bag is beautful, a great find! I love your easy summerly look! Great clutch! You do look fab with short hair! And I enjoyed the tour of your mall - I have fond memories of malls - I was a mall rat growing up!